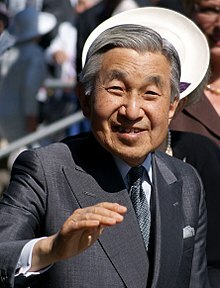 Akihito (明仁?, born 23 Dezember 1933) is the Emperor (天皇, tennō?) o Japan the noo, an the 125t Emperor accordin ti Japan's tradeetional order o succession. He acceded til the throne in 1989, an is the 19t maist senior monarc. He is the warld's anly currently rignin monarc that haes a teetle translatit intil Scots an Inglis as "Emperor". Wikimedia Commons haes media relatit tae Emperor Akihito.